Red Bull KTM’s Tony Cairoli clinched his second Grand Prix win of the season under sunny British skies at Matterley Basin while Tom Vialle excelled in the MX2 class to capture 3rd position and enjoy his first taste of the podium in only his second FIM World Championship appearance. The first European round of 2019 MXGP landed in the UK after the long trip to Argentina to open the series. Former Motocross of Nations venue Matterley Basin provided a fast, challenging and sun-kissed setting for the Grand Prix of Great Britain and for what was a busy and popular fixture on the calendar. Red Bull KTM went to southern England at half strength with MX2 World Champion Jorge Prado (left shoulder) joining Jeffrey Herlings on the sidelines but with the Spaniard hopeful of a swift return. Tony Cairoli missed out on his first Qualification Heat win on a cloudy and cold Saturday due to a mistake on the last lap of the race that cost the nine-times world champion the chequered flag. Under blue skies on Sunday Cairoli kept his head and it was his rival and first moto leader Tim Gajser who fell and gifted a free run for #222 to the finish line. 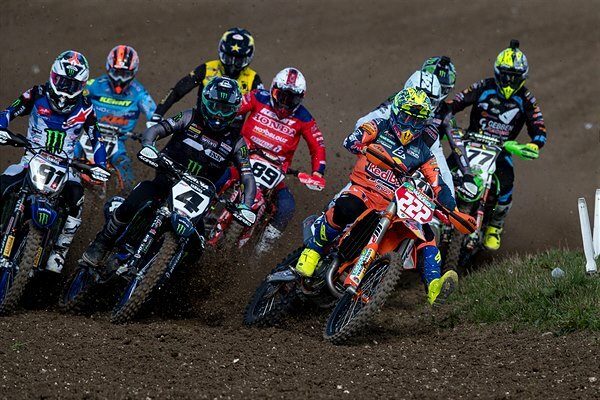 The result marked the third consecutive moto win for Cairoli this season. In the second race the Italian – who had been struggling with a stiff right shoulder and neck in the build-up to Matterley – rode to second place behind Gajser: shadowing the 2016 champion closely in the final laps and finishing only 1.7 seconds adrift. Cairoli’s second consecutive success this year gives him an 8 point lead in the early standings. Tom Vialle continues to make fast and impressive progress in his Grand Prix rookie season. Matterley Basin was just his second MX2 start with the factory KTM 250 SX-F and the 18 year old grabbed the holeshot in the first moto and ran inside the top three for the duration of the 30 minutes and 2 lap duration. Around a rougher and slick surface Vialle again held the lead for almost half of the race before succumbing to the pace of eventual winner Thomas Kjer Olsen. Vialle managed to classify 3rd and was thrilled to walk the podium in 3rd overall, emulating Jeffrey Herlings in obtaining a trophy in just his second Red Bull KTM showing. MXGP heads east and to the European mainland this week with round three taking place in the rough shallow sand of Valkenswaard for the Grand Prix of Netherlands next weekend.